Background and Aim of Study: Diagnostic and therapeutic uniportal video-assisted thoracic surgery (VATS) is now considered a feasible and safe procedure with good results. In this retrospective chart review study, I will present our experience in diagnostic VATS at King Abdul Aziz Specialist Hospital, Taif, Saudi Arabia. Materials and Methods: The data of 108 patients undergoing uniportal diagnostic VATS in King Abdul Aziz Specialist Hospital, Taif, Saudi Arabia, from January 2013 to June 2015, were collected through a review of their hospital records. Results: The study included 108 patients (75 males and 33 females) with a mean age of 36.4 ± 8.1 years. The mean operative time was 28.5 ± 6.7 min. The most common morbidity was intraoperative bleeding that occurred in 15 cases (13.9%) and was easily controlled. Failure of VATS occurred in three cases (2.8%) due to massive adhesions, necessitating minithoracotomy. Reinsertion of the intercostal tube was required in 12 cases (11.1%). The mean duration to removal of the intercostal tube was 4.4 ± 0.9 days. The mean hospital stay was 6.4 ± 1.4 days. No operative or early postoperative mortality was recorded. Conclusion: Uniportal VATS is a safe and effective method for the diagnosis of intrathoracic lesions allowing resection of small localized lesions. It has a limited operative time that is improving with progress in the learning curve. Uniportal diagnostic and therapeutic video-assisted thoracic surgery (VATS) is accepted by most thoracic surgeons for the management of intrathoracic lesions. The procedure has gained acceptance since it has the same oncological principles of open thoracotomy and multiportal VATS.,, Uniportal VATS is associated with less pain, less operative trauma, a shorter hospital stay, and a faster postoperative recovery.,,,,, Although global utilization of the uniportal technique in research and clinical practice has shown promising short-term results, long-term results are lacking.,, In this retrospective chart review study, we will present our experience using diagnostic VATS in the Department of Thoracic Surgery at King Abdul Aziz Specialist Hospital, Taif, Saudi Arabia. This retrospective chart review study involved 108 patients who underwent uniportal diagnostic VATS in King Abdul Aziz Specialist Hospital, Taif, Saudi Arabia, from January 2013 to June 2015. After receiving the approval of the hospital's Ethical Committee and obtaining informed consent from the patients or their relatives, data were collected by review of the patient files. Data collected included demographic features, clinical presentation, imaging reports, operative findings, histopathology, and bacteriological culture results. Data were gathered and analyzed with exclusion of cases with incomplete reports. In addition, cases with lesions invading the chest wall and those requiring rib spreading were excluded from the study. 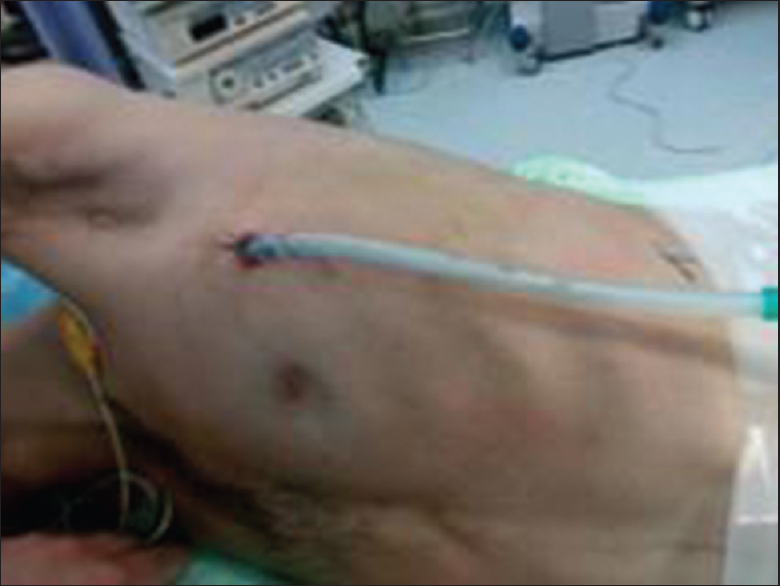 Regarding the procedure, in most cases, an intercostal chest tube was inserted [Figure 1] and removed to create an opening into the thoracic cavity [Figure 2], through which a 10-mm trocar was introduced. In the remainder of cases, a 1-cm incision was made just anterior to the midaxillary line in the fifth intercostal space for trocar introduction. After trocar introduction, a 10-mm 30° scope with a 5-mm working channel was introduced [Figure 3]. Any intrapleural fluid was suctioned and submitted for chemical and microbiological analyses. Subsequently, a panoramic view was used to explore the intrathoracic structures including the lung, pleura, thoracic wall, diaphragmatic surface, mediastinum, and pericardium [Figure 4], allowing identification of the target areas. All localized nodules were excised. 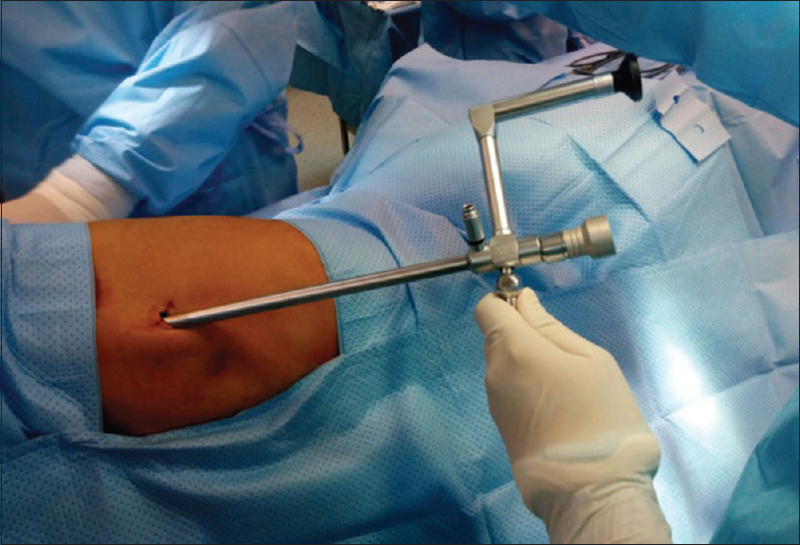 If the lesion was not localized, 3–4 biopsies were obtained using diathermy forceps or harmonic scalpel, and hemostasis was accomplished by direct pressure. In cases of traumatic hemothorax, following suction and exploration, actively bleeding vessels were secured by compression or/and diathermy (cases with major vascular injury were not included in this study). Chest tube was inserted if minor oozing was anticipated. The lung was inflated under direct vision, and the incision was closed. After coding and tabulation of the collected data, statistical analysis was performed using SPSS program version 18.0 (SPSS Inc., Chicago, IL, USA). Descriptive statistics were done, and quantitative data were expressed as number, percentage, and mean ± standard deviation. Demographic data and clinical presentation are shown in [Table 1]. 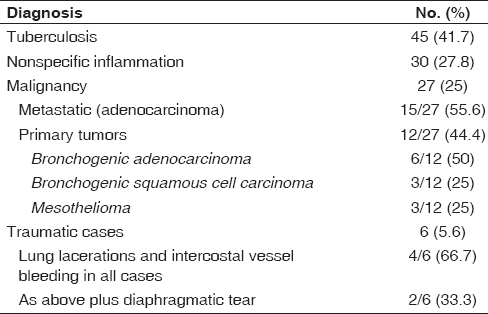 Operative findings and final diagnosis are shown in [Table 2] and [Table 3], respectively. The mean operative time was 28.5 ± 6.7 min. The most common morbidity, intraoperative bleeding, occurred in 15 cases (13.9%) and was easily controlled. Failure of VATS occurred in three cases (2.8%) due to massive adhesions, subsequently requiring minithoracotomy. 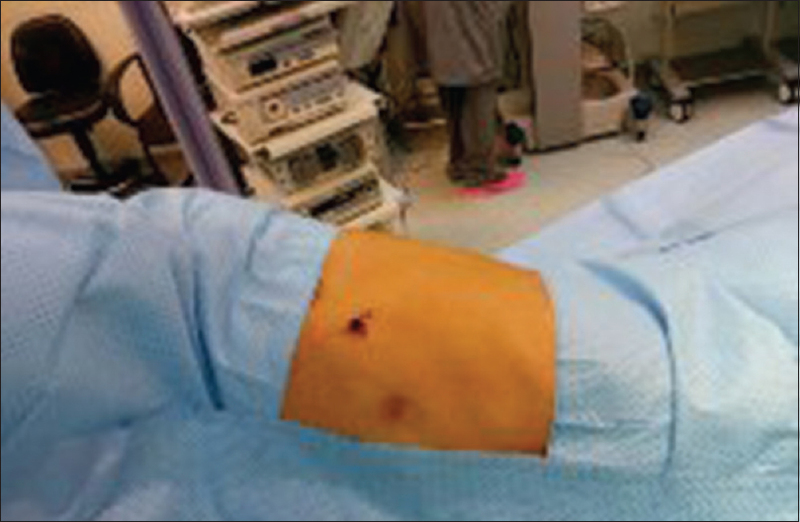 Reinsertion of an intercostal tube after initial removal was required in 12 cases (11.1%). The mean duration to the removal of the intercostal tube was 4.4 ± 0.9 days. The mean length of hospital stay was 6.4 ± 1.4 days. No operative or early postoperative mortality was recorded. Tamura et al. compared the outcomes of uniportal versus multiportal VATS and verified that the uniportal technique had better pain control and a decreased length of hospital stay by 0.5 days (P < 0.05). 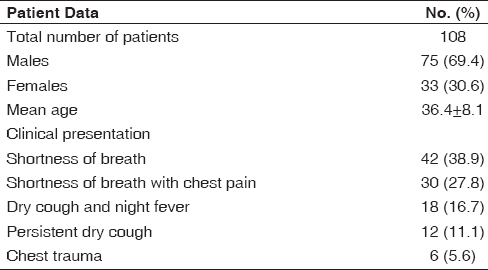 In addition, they found that the duration of time until chest drain removal was decreased by 1 day (P < 0.05). For minor thoracic procedures, most authors have shown a statistically significant reduction in pain scores during the inpatient stay. Similar results were reported by Salati et al. In this study, postoperative pain was minimal and required a simple analgesic for control, likely because the incision was limited to a single intercostal space. The mean duration of time to remove the intercostal tube in this study was 4.4 ± 0.9 days, with a mean hospital stay of 6.4 ± 1.4 days. Rocco et al. reported similar results with intercostal tube removal after a mean of 4.3 days and a mean length of hospitalization after uniportal diagnostic VATS of 5.3 days. Reinsertion of the intercostal chest tube in this study was required in 11.1% of cases, similar to the 10%–15% frequency of chest tube reinsertion in previous studies., Similar results were also reported by Chen et al. and Jutley et al. Their studies compared uniportal and multiportal VATS in minor procedures and reported no serious complications or mortality in either group. No operative or early postoperative mortality was observed in this study. However, Rocco et al. reported a mortality of 2.4% and related this to associated serious comorbidities. In this study, uniportal VATS helped to confirm the diagnosis in 97.2% of cases. In the other 2.8% of cases, a minithoracotomy was required to establish the diagnosis. In a study by Aragón and Perez Mendez, a minithoracotomy was required in 9.7% of cases. It appears clear that uniportal VATS used in minor procedures for diagnostic purposes carries a significant advantage over multiport approaches that have been associated with higher pain scores, longer hospital stays, and higher costs.,,,,, Postoperative pain is decreased in uniportal VATS because there is less contact with surgical instruments. Adverse events are rare, with the possibility of infection or seroma at one surgical site in multiple studies; only one surgical-site infection and one seroma have been reported in patients undergoing uniportal VATS.,,,,,,,,, Nonetheless, Mier et al. reported no differences between the uniportal and multiportal approaches in mean operative time, hospital stay, pain scale, or total surgical material cost, even though they reported a higher satisfaction rate in patients of the uniportal group regarding wound scarring. However, additional larger randomized studies should be done to further clarify the potential benefits of uniportal VATS. Uniportal VATS is a safe and effective method for the diagnosis of intrathoracic lesions. It allows for the resection of small localized lesions and has a limited operative time that is continuing to improve with progress in the learning curve. Rocco G, Martucci N, La Manna C, Jones DR, De Luca G, La Rocca A, et al. Ten-year experience on 644 patients undergoing single-port (uniportal) video-assisted thoracoscopic surgery. Ann Thorac Surg 2013;96:434-8. Ismail M, Helmig M, Swierzy M, Neudecker J, Badakhshi H, Gonzalez-Rivas D, et al. Uniportal VATS: The first German experience. J Thorac Dis 2014;6:S650-5. Aragón J, Pérez Méndez I. From open surgery to uniportal VATS: Asturias experience. J Thorac Dis 2014;6:S644-9. Tamura M, Shimizu Y, Hashizume Y. Pain following thoracoscopic surgery: Retrospective analysis between single-incision and three-port video-assisted thoracoscopic surgery. J Cardiothorac Surg 2013;8:153. Salati M, Brunelli A, Xiumè F, Refai M, Sciarra V, Soccetti A, et al. Uniportal video-assisted thoracic surgery for primary spontaneous pneumothorax: Clinical and economic analysis in comparison to the traditional approach. Interact Cardiovasc Thorac Surg 2008;7:63-6. Chen YB, Ye W, Yang WT, Shi L, Guo XF, Xu ZH, et al. 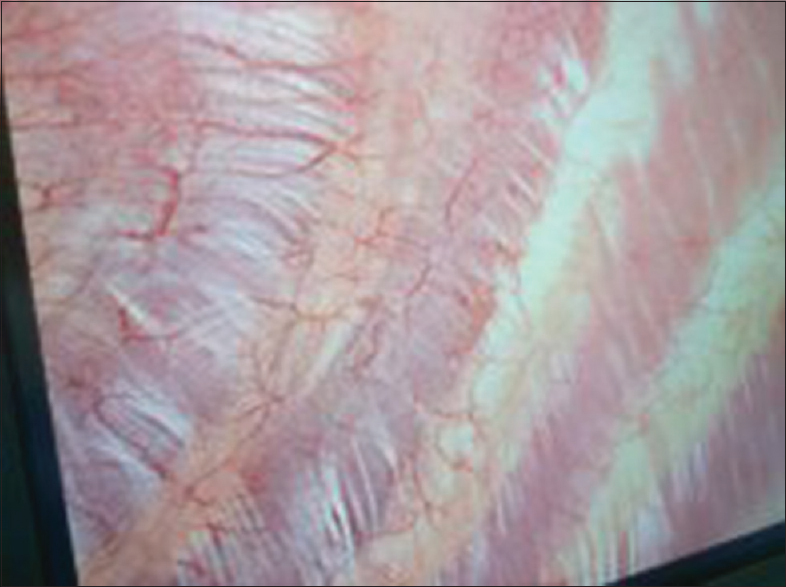 Uniportal versus biportal video-assisted thoracoscopic sympathectomy for palmar hyperhidrosis. Chin Med J (Engl) 2009;122:1525-8. Jutley RS, Khalil MW, Rocco G. Uniportal vs. standard three-port VATS technique for spontaneous pneumothorax: Comparison of post-operative pain and residual paraesthesia. Eur J Cardiothorac Surg 2005;28:43-6. Grossi W, Masullo G, Londero F, Morelli A. Small incisions, major complications: Video-assisted thoracoscopic surgery management of intraoperative complications. J Vis Surg 2018;4:12. McElnay PJ, Molyneux M, Krishnadas R, Batchelor TJ, West D, Casali G, et al. Pain and recovery are comparable after either uniportal or multiport video-assisted thoracoscopic lobectomy: An observation study. Eur J Cardiothorac Surg 2015;47:912-5. Rocco G, Internullo E, Cassivi SD, Van Raemdonck D, Ferguson MK. The variability of practice in minimally invasive thoracic surgery for pulmonary resections. Thorac Surg Clin 2008;18:235-47. Ismail M, Swierzy M, Nachira D, Rückert JC, Gonzalez-Rivas D. Uniportal video-assisted thoracic surgery for major lung resections: Pitfalls, tips and tricks. J Thorac Dis 2017;9:885-97. Mier JM, Chavarin A, Izquierdo-Vidal C, Fibla JJ, Molins L. A prospective study comparing three-port video-assisted thoracoscopy with the single-incision laparoscopic surgery (SILS) port and instruments for the video thoracoscopic approach: A pilot study. Surg Endosc 2013;27:2557-60.